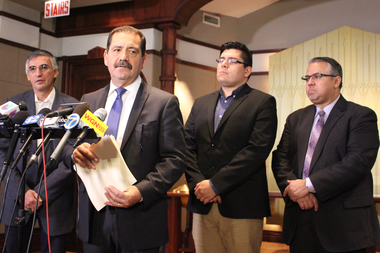 Cook County Commissioner Jesus "Chuy" Garcia led Latino politicians in calling for State's Attorney Anita Alvarez to resign. THE LOOP — A top rival to Mayor Rahm Emanuel led calls from Latino politicians Monday for Cook County State's Attorney Anita Alvarez to step down. Accusing Alvarez of "petty vindictiveness" and suggesting a "cover-up" in the Laquan McDonald police shooting, Cook County Commissioner Jesus "Chuy" Garcia (D-Chicago) led Latino aldermen in the City Council in calling for her resignation. "Anita Alvarez has lost whatever remnants of credibility she has had," Garcia said. "Over a year it took her," added Ald. Ricardo Munoz (22nd), to file charges against officer Jason Van Dyke, who shot the 17-year-old McDonald 16 times in October 2014 as other officers stood by at 41st Street and Pulaski Road. Munoz said it was clear from the police dashcam video released last week that charges should have been filed immediately. 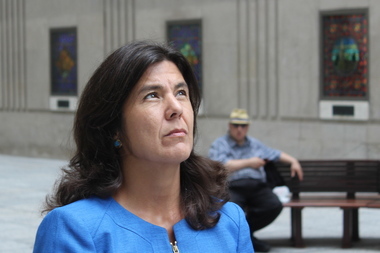 Cook County State's Attorney Anita Alvarez accused her critics of playing politics. "We need a full investigation," Ald. Carlos Ramirez-Rosa (35th) said, demanding an independent prosecutor in the case. Ald. Gilbert Villegas (36th) repeated calls by the council's Latino Caucus for hearings on the matter before the Public Safety Committee and the Human Relations Committee. Garcia acknowledged their demand was doubly damning in that Alvarez is the first Latina to occupy the office. "There's no fun in it," Garcia said. "We would want to be her strongest supporters." Ald. Susan Sadlowski Garza (10th) also joined in calling for Alvarez to resign, and the group claimed the additional support of Aldermen Joe Moreno (1st) and Roberto Maldonado (26th). They joined a growing chorus calling for Alvarez's resignation. Cook County Board President Toni Preckwinkle called for Alvarez to resign Monday, after asking Emanuel to fire Police Supt. Garry McCarthy last week. The City Council's Black Caucus called for McCarthy's firing and said they had "no confidence" in Alvarez last week, when the National Bar Association also called for Alvarez to step down. West and South Side leaders have called on Alvarez to resign, most forcibly in street protests along the Magnificent Mile on Michigan Avenue on Friday. And the Rev. Michael Pfleger has demanded that Fraternal Order of Police union spokesman Pat Camden resign for his unwavering support of police shooters. Like the Black Caucus and other groups, the council's Progressive Reform Caucus has asked for an independent prosecutor in the McDonald case. Alvarez lashed out at her critics Monday. "I am a professional prosecutor and I am not driven by politics," she said in a statement. "I will not be bullied by politicians who do not have a full understanding of the facts of this investigation. "I offer no apologies for enlisting the FBI to investigate Laquan's murder because obviously the Chicago Police Department could not investigate themselves in this case. And I certainly do not apologize for conducting a meticulous and thorough investigation to build the strongest possible first-degree-murder case against Officer Van Dyke." Asked if his race against Mayor Rahm Emanuel earlier this year played a role in the delays in the case, which first came to light with a $5 million settlement approved by the City Council in April, a week after his loss to Emanuel in the runoff, Garcia said simply, "It probably did."